Kids have it sussed. Asking ‘why?’ of any situation is enlightening. It opens the mind, allows for new ways of doing things, encourages creativity and subdues the common adult fault of passive acceptance. Very little in life occurs by chance. Almost everything that we encounter is due to a choice – yours or someone else’s. 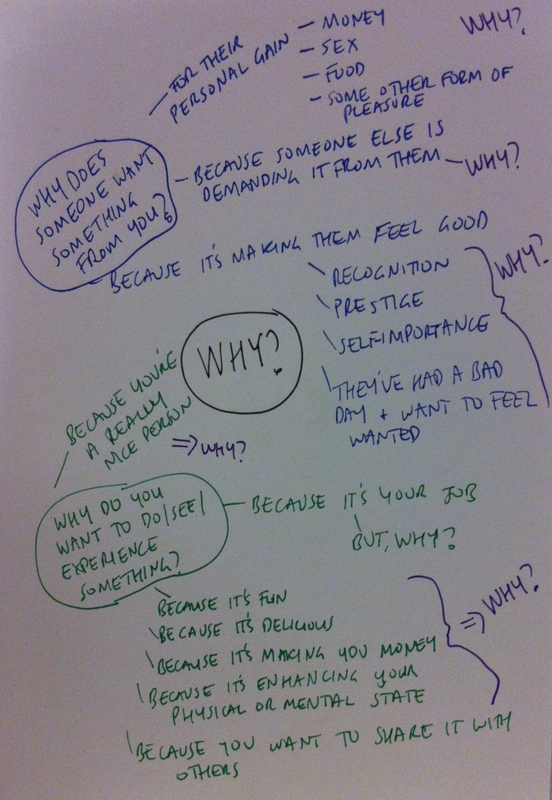 Understanding ‘why’ leads to many awesome insights. It helps us understand why others take the actions they take. It helps us understand why we ourselves do certain things. It teaches us about the fundamental drivers that influence different areas of our lives. It teaches us about history, science, emotion and business. It helps us to not take things for granted and gives us the opportunity to give others the benefit of the doubt. Why is your friend gloating about their pay rise? Not because he’s being snarky, but because he’s been feeling low and wants to feel better about himself. Why is your client being so demanding? Because she’s been given a hard word about her performance. Why is the driver behind you being so aggressive? Because they’re going through a separation and are at the height of anxiety. Kids ask ‘why?’ because often they don’t yet have the life experience to piece cause and effect together. Later, as time starts passing us by faster and faster, we cease questioning. We take a step back, make assumptions and indifferently tolerate, or not tolerate, what’s happening around us. Asking ‘why?’ takes us back to the basics, providing a deeper understanding of people and life. Asking ‘why?’ grounds us. We should never stop questioning. If you find that you’ve stopped asking ‘why?’, it’s time to start once more. For sure! Understanding ‘why’ can often help us do that faster, but there are certainly many situations in which we’ll be asking ‘why’ forever and never, ever know. You’re bang on.